NEW YORK—Touting its mission to advance the interests of democracy by keeping Americans informed ahead of the Nov. 6 vote, an election-crazed New York Times announced Tuesday an expansion of its poll coverage to 18.5 million more races in 371 additional states. “We’re proud to say we’ve dispatched teams of reporters to cover the gubernatorial races in hundreds of previously neglected and/or nonexistent regions of the United States, in addition to commissioning in-depth profiles of leaders from seven new political parties,” said Times executive editor Dean Baquet, wild-eyed and salivating as he explained that the paper’s efforts would soon result in detailed, illuminating coverage from local races in Southeast Carolina, Arkavania, Nevadlaska, and New Iowa. 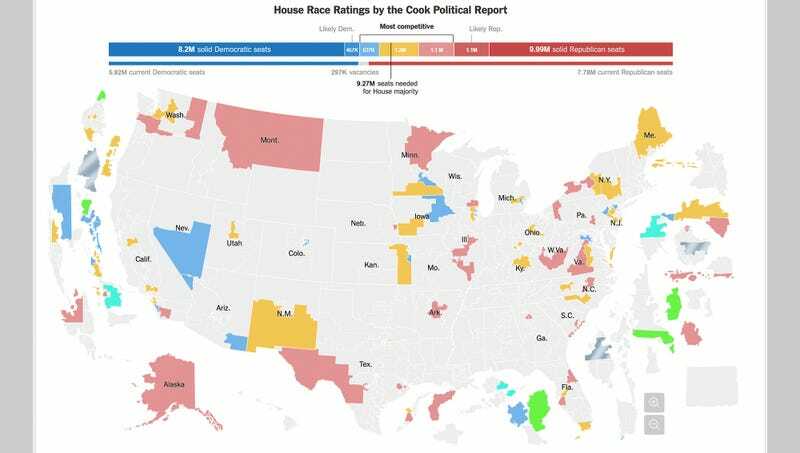 “We’re closely watching more than 90 states that are traditionally purple but have a strong chance of going either lime green or silver, depending on how the swing votes shake out. It’s really going to come down to voter turnout, since there are currently more than 800,000 races in a statistical dead heat. Covering them all is a lot of work, but it’s how we ensure Americans will know exactly what to expect on Election Day.” The visibly frenzied Baquet went on to explain that his newspaper would also embark on a series of long-form interviews with 900 billion white working-class Americans who previously voted for Trump.